It was four thirty in the morning and we were heading for the boat dock for the local five o’clock ferry to Hangzhou. Our driver pulled up by a shack that was the ticket office. We were expecting the usual double charging policy for foreigners, or at least a demand for payment in FECs (Foreign Exchange Certificates), but neither occurred. The boat crew inspected us with the bored expression of those who have seen enough foreigners for the novelty to have worn off. The reaction of the few passengers was the opposite, and consequently we were subjected to more of those long, blank, unmoving stares that characterized so much of travelling in China in those days. As we were expecting the usual mad rush of excited peasants, scrambling for scarce seats, we quickly boarded and grabbed a place by the window. However, there was no last minute assault. In fact, there were only around 15 of us by departure time, making the large ferry look rather empty and forlorn. It was cold, terribly cold. As we waited for the boat to leave, an animated discussion broke out amongst the crew. Not understanding Chinese at the time, we could only speculate as to what was going on. It was the fog. The boat wasn’t going to leave until the fog lifted. 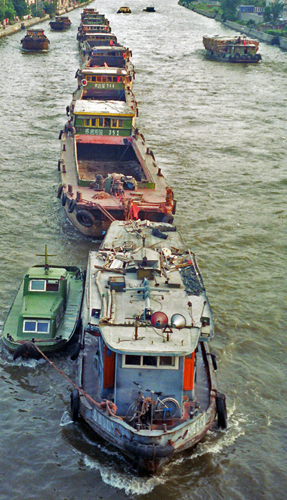 Some passengers already began to abandon ship. We sat shivering, waiting for something to happen, our feet frozen. Meanwhile, three dirt- poor peasants, a man, his wife and what might have been a sister, all wearing blue padded Mao suits, had become obsessed by our presence. They shamelessly gaped at us and leered over our shoulders, their faces mostly expressionless, except when pointing at some part of our bodies, commenting on it and then roaring with laughter. Suddenly there was a hoot and we were off, though the fog hadn’t lifted. Twenty minutes later we stopped again. I could just make out the famous Precious Belt Bridge we had visited only the day before, so I knew we hadn’t gone far. 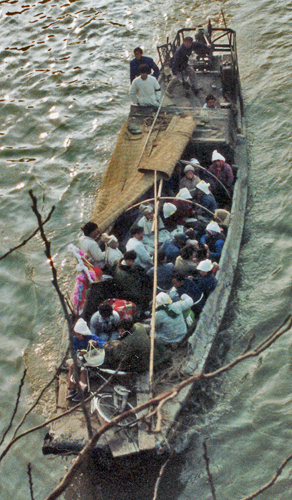 By this time, the remaining passengers had started giving up and abandoning the boat, leaving us with the three peasants. A miserable two hours followed. The cold pierced all parts of our bodies; the garlicky breath of the peasants on the back of our necks was oppressive and vile. I was sure Margie was cursing me. This had been my idea. I began to waver and thought that we too might give up on what I had thought would be a romantic trip along the Grand Canal. Just as our discomfort started reaching unbearable levels, a ray of light broke through the fog and, like a curtain rising in the theatre, it lifted and vanished in a matter of minutes, revealing a beautifully sunny winter’s day. The Captain hooted the horn and we were off again. I love rivers and river scenery and the Grand Canal, one of the world’s great engineering feats, has some of the most fascinating and beautiful vistas I’ve ever seen. 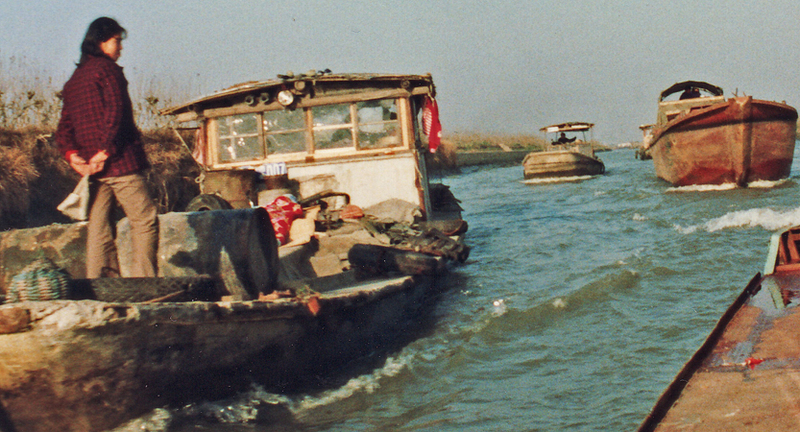 It is not dramatic like the Yangtze, or brimming with legends like the Yellow River, but it is full of life and mystery. 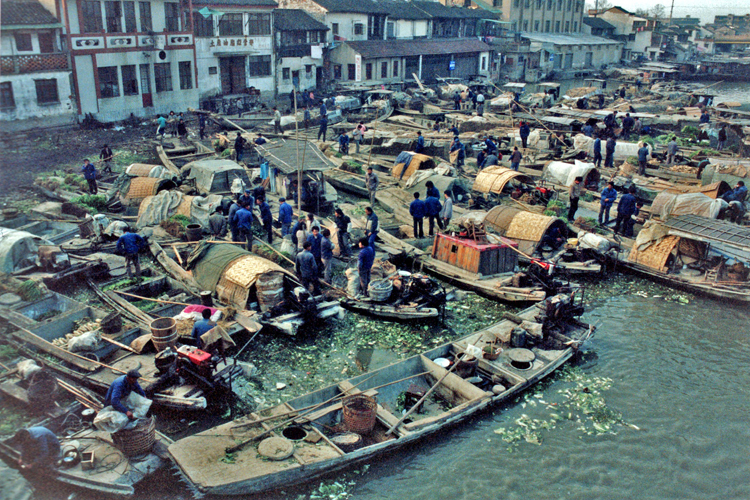 Work on the waterway best known as the Grand Canal began during the Sui Dynasty (581-618), though for centuries before local rulers had been attempting to build canals in the area. Its sheer size and scale rivals the building of the Great Wall; and like the Great Wall its construction cost the lives of millions of labourers. 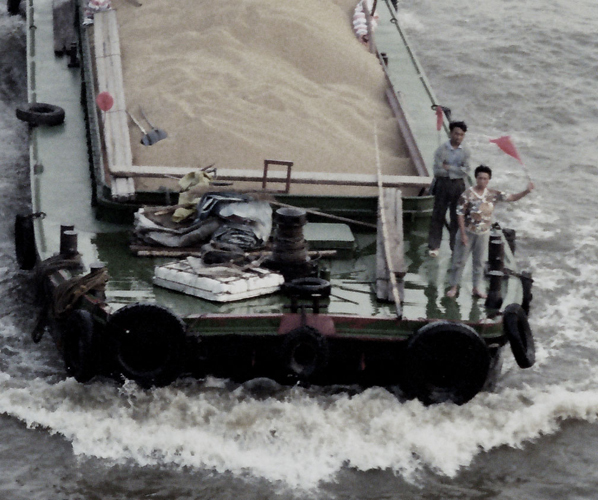 The Canal’s main purpose was to transport rice, grains and salt from the rich, fertile Southern provinces to the barren and drought- prone North. 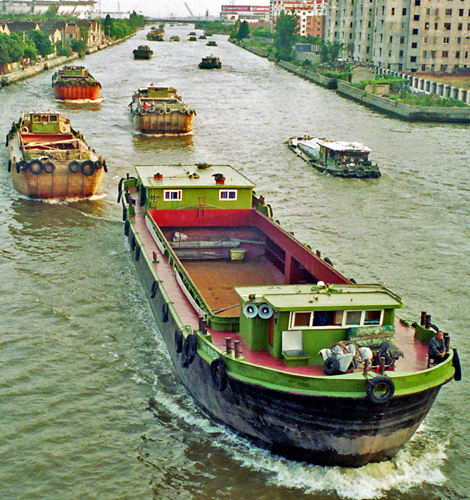 The total length of the Grand Canal is roughly 1,770 km. 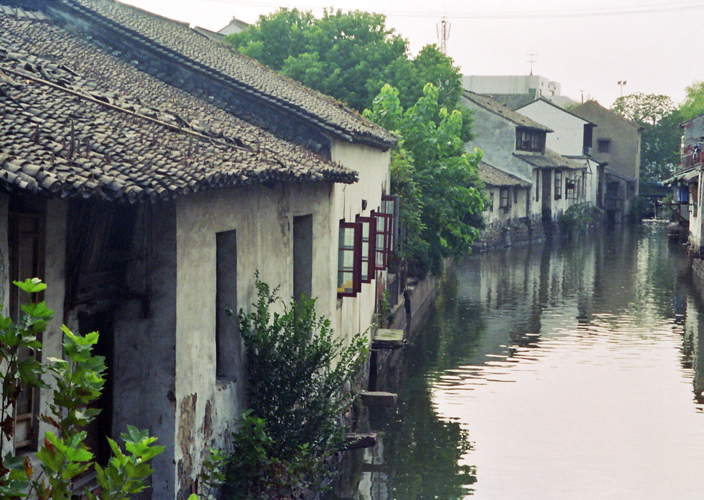 The Canal’s history has been a turbulent one, and many of China’s rebellions have had their origins in its environs. For instance, it was a fertile breeding ground for secret societies, such as the fanatical Buddhist Sect, the ‘White Lotus Society’. During its eventful past, the Canal was often left to fall into neglect, only to be revived again and restored to its former glory several times. 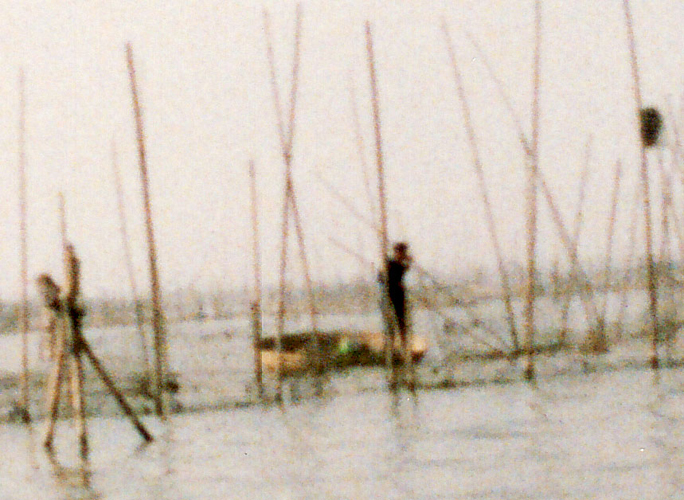 In 1990, the landscape between Suzhou and Hangzhou was predominately rural: the bucolic images of bamboo huts propped up on stilts, peasants in conical boats harvesting water chestnuts, and the odd fishing junk with its ragged, but romantic sails trying to catch what little breeze there was, could have been plucked straight from a scroll painting, dating from a time when China was still ruled by the Son of Heaven. 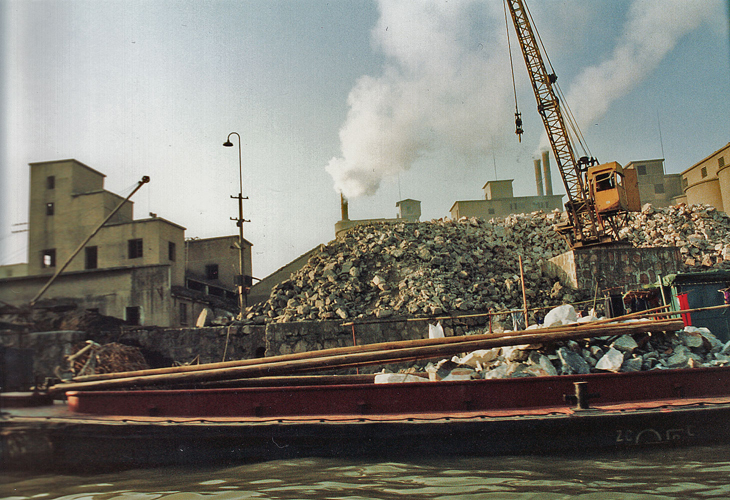 Of course, the modern world had encroached upon and entered into the secret world of the Grand Canal: the towns we passed were grey and industrial, their high chimneys belching black smoke into the blue sky. Huge barges, loaded with coal and grit, sometimes in convoys nearly half a kilometre long, plied the waterways in a constant to and fro. 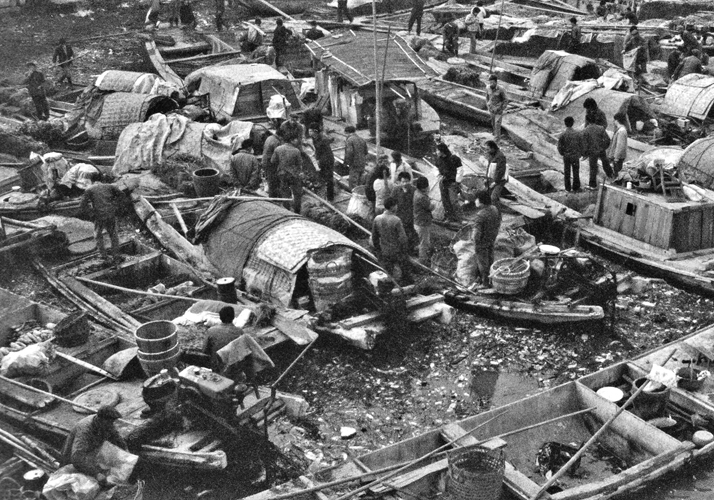 Competing with the barges was a flotilla of small boats, manned by entire families and their pets. How the boats managed not to crash I’ll never know. Or perhaps they did, and often, but we never saw it. I do remember the women standing on the prow, frantically waving red flags to warn other boats of their right of way. To get a better view, I went up onto the cabin and stood with the captain as he steered the ferry through the maze of waterways. The crew pretended to ignored me, but given the lack of passengers, I must have made an amusing distraction. I could tell from their gestures that most of their conversation had something to do with my physique. The most curious part of the canal were the signposts: they protruded from the water at the immense intersections, putting some order into what looked like an incomprehensible jigsaw puzzle, especially as high banks and reeds obscured any potential land marks. At times, we passed through narrow canals, almost touching the banks, at other times we skirted the edge of a huge lake, as immense as an inland sea. It was at these moments when I could imagine the secret societies hiding here, plotting their rebellions, safe in the thought that the Imperial troops would never track them down in this watery labyrinth. Lunch was cold rice and blubbery pork fat with bristles. We poked our chopsticks around, nibbling the former and shunning the latter. The three peasants looked on hungrily. As we handed them the grisly looking meat, which they immediately wolfed down ravenously, they gave us a smile for the first time, instead of just laughing at us. As a result, we even began to feel a slight sense of comradeship with our uncouth fellow travellers. We were obviously going to arrive late in Hangzhou. The late afternoon winter sun was turning the countryside and the canals into a deep rich gold. Winter birds and fowl skimmed the water, the fishermen and water chestnut farmers were heading home. As dusk fell, small lights came on in the stilted bamboo huts. Suddenly it was pitch black and the only sound was the engine of the ferry. The cold, forgotten during the visual feast in daylight, returned with a vengeance as the night took hold, and we began to look forward to arriving in Hangzhou. We dozed a little and I realised that at some point along the way the three peasants had disembarked. When we finally arrived at our destination, we were the only passengers left. I waved goodbye to the crew at Hangzhou dock. They nodded back with mild recognition as we headed off into the dark, empty streets of China’s number one tourist destination to try and find a cheap hotel. A few years later, we heard that the local passenger ferry had been discontinued; new roads and a regular bus service its death knell. These days, it appears that there is a luxury tourist boat that does the trip at night. What I can’t work out is, why travel at night? Surely, the best part of the trip is taking in life on the Canal…. Obviously, a lot has changed in this region; new super highways and bridges criss-cross the Canal, or run parallel to it. The cities have expanded and the feeling of wilderness and being in a secret world is less evident than it was 20 years ago. 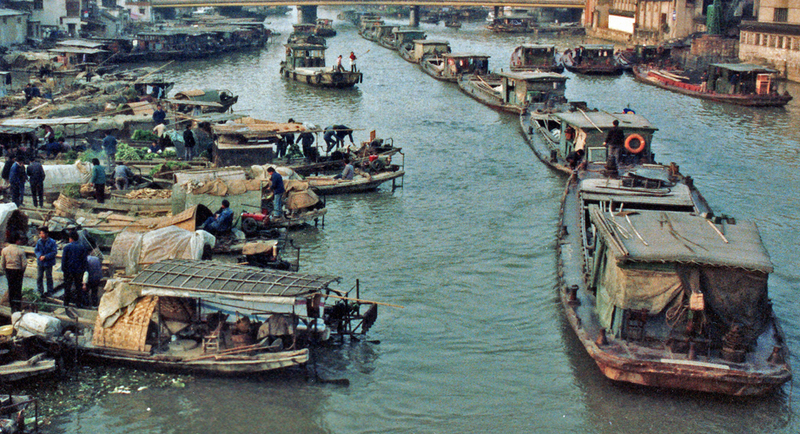 Nevertheless, river traffic is still intense, and only two years ago I sat for hours on a bridge just outside Suzhou overlooking the Canal, and it was still an amazing experience! of tons of valuable information, thanks for providing such data.